The Odai River, also called River Odai, was a river running north to south on the island of Vvardenfell in Morrowind. It began in the West Gash region just north of Balmora and flowed placidly through the center of the city to the Odai Plateau. It then passed through the Ascadian Isles region before emptying into the Inner Sea at the eastern edge of the Bitter Coast near the town of Hla Oad. The terrain surrounding much of the river was mountainous and dotted with mines. A rough track along the western shore of the river connected Hla Oad with Balmora. It's unknown how the river was affected by the cataclysms of the Red Year. The Ogres Tooth Mountains are a range of mountains on the island of Stros M'Kai in the kingdom of Hammerfell. They are found to the west of Port Hunding and take up roughly a third of the available land area. The mountains are notable for the Dwemer ruins of Bthzark. Its mines and other facilities delve into the southern half of the range, while the steam and gas harvesting system that powers the mechanisms inside lie above ground in the northern mountains. Two large bridges cross a pass that cuts the range in two, and the steam pipes cross with them. Oldgate (also spelled Old Gate) is a fortified gate located on the border of the region of Rivenspire, situated within the province of High Rock. Oldgate serves as the regional bulwark for the city of Shornhelm, and a gateway between Rivenspire and Stormhaven. It works adjacent with Newgate, which is found in Stormhaven instead of Rivenspire. It is the home of the Oldgate Lancers. Orcrest is a city in Anequina in northern Elsweyr. The Orsinium Area was a Third Era political entity situated in the Iliac Bay region, inhabited by Orcs and ruled from the city of Orsinium. It bordered Menevia, Wayrest, and the Wrothgarian Mountains. The Lyrezi clan was the predominant vampire bloodline in the region. After the Warp in the West, the region became a part of the larger kingdom of Orsinium. 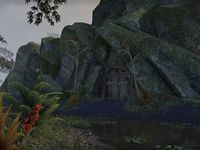 Othrenis (alternatively called Eagle Moor[nb 1]) is a necropolis that is located in the region of Stonefalls, within the province of Morrowind. Othrenis houses various key figures during the time of the Chimeri, such as Mavos Siloreth, a highborn mage who was responsible for sealing the Brothers of Strife in the twin volcanoes of Stonefalls.